With our personal human networks in Thailand and researches on Asian countries, we chose Thailand as the first country to implement this project which we named as IDCE. However, we had never taught computer science to Thai-speaking students with no previous experiences in computers. So, as a trial, we decided to invite two Thai college students, Ms. Mod and Ms. Noi, to KCG, Kyoto, Japan, and offered a two-week workshop at IDCE/KCG. This helped IDCE prepare for the workshop to be held the following year in Thailand. These two students later helped the class in Thailand as assistant instructors. To raise funding to realize the project, we supported the government of Thailand to apply for a grant at the Japan Exposition Commemoration Fund Project. 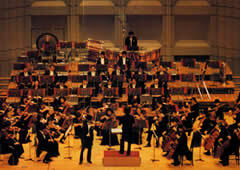 We also organized a charity concert in Tokyo, Osaka, and Kyoto. 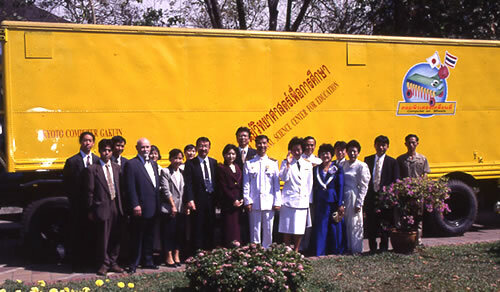 In June, 1990, we donated three hundred fifty one sets of computers to the Ministry of Education in Thailand. These computers were distributed throughout Thailand and installed in 17 educational centers (for the public) throughout Thailand. 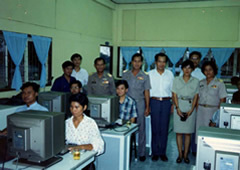 In July, 1990, we offered the first on-site computer course at Bangkok. The Thai Ministry of Education selected participants, one institution each from 17 rural areas outside Bangkok, and invited total of 40 teachers from those centers to take the course. Those teachers, whom we call, "teacher-students," were trained in mathematics or science but had no experiences in computers, nor had they ever touched computers before. After the course, the teacher-students were obligated to return to their centers with donation and start a computer class of their own. In October, 1990, we invited 22 out of the 40 teacher-students to IDCE/KCG for a more advanced computer course. 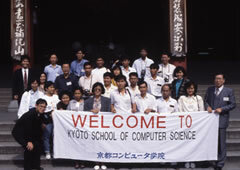 After the Kyoto seminar, the teacher-students then returned to their centers, as they had agreed, and started a computer course for the very first time for the public in their areas. In every corner of Thailand, it was the very first time to welcome computers. We were informed that, in every center, the reservation for the computer training courses were booked right away and completely for one year. 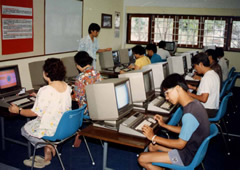 This was truly the beginning of computer education throughout Thailand. 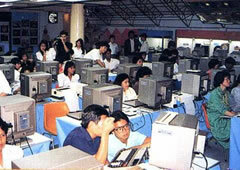 In February, 1992, we offered the third computer seminar for Thai teachers at IDCE/KCG. By then, we have implemented IDCE in Ghana and Poland, so the seminar was joined by teacher-students in those countries as well. 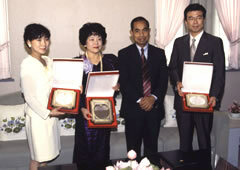 In November, 1992, the IDCE founders, Yasuko and Yu Hasegawa, along with Wataru Hasegawa, received awards from the Thai Ministry of Education for the contribution to the country. After that, we were informed that computer education was now right on track in Thailand with increasing budget allocations from the Thai government. 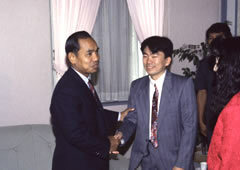 In 1994, the highly successful result of IDCE prompted the Thai government and the Japan International Cooperation Agency (JICA) to form a cooperative arrangement for further development. 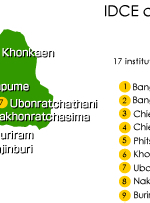 Their cost-sharing project made it possible for the workshop in multimedia technology to be held at KCG for the computer engineers from Thailand for six months. Also, our staff, Dr. Yoichi Terashita, was appointed as a JICA specialist, and was sent to Mahidol University in Thailand for directing education in multimedia technology in 1996. 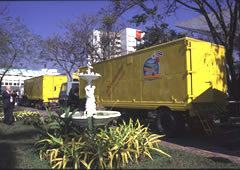 In 1996, with our next donation of thirty, 32-bit portable computers, we implemented the “Computers on Wheels” program in Thailand. The computers were placed inside the "classroom" in the two trailers, which traveled to rural areas throughout Thailand with IDCE/KCG volunteer instructors, offering free classes. The targetted students were people in those indigent areas of the country, who otherwise would not have had the opportunity to even touch computers. 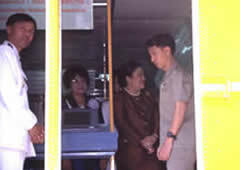 The program was to provide servicse for 100,000 people/year. The program was opened with the Thai Pricess's official tape-cut, and the two trailers with instructors including the ones from IDCE/KCG left for the free mobil classroom throughout Thailand. 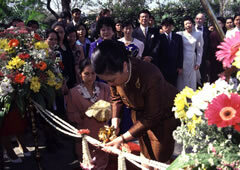 Later, the Princess presented an award of honor to Yasuko, Yu, and Wataru Hasegawa for the continuous contribution of computer education to the people of Thailand. October Two Thai college students invited to IDCE/KCG. June 351 computers donated to theThai Ministry of Education. 4 IDCE/KCG teachers and 6 IDCE/KCG students sent to Thailand to teach the seminar. 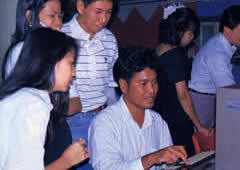 The first seminar held at Bankok to train teachers for the donated computers. February The donated computers settled at the educational museum in Bangkok as well as non-formal education centers in 17 areas throughout Thailand. Computer education starts by the local teachers who had the training from IDCE. February The Second Support – the third seminar held at IDCE/KCG. 6 participants selected and invited to Japan from the centers where the donated computers were settled. November Awards from the Ministry of Education in Thailand. The Third Support – 30 notebook computers donated to the Ministry of Education. "Computers-on-Wheels" program begins with 2 teachers sent from IDCE/KCG; two trailars travel throughout Thailand with a computer classroom in each. Received awards from the Ministry of Education. Received awards from the Princess of Thailand.